These Gluten-Free & Vegan Buffalo Chickpea Meatballs are the perfect party appetizer! They’re especially delicious when drizzled with some homemade vegan ranch dressing and topped with chopped scallions. Rah! Rah! Rah! Sis, boom, bah! For this year’s big game, I’m cheering for the best team in town…Team Chickpea! That’s right! When you route for Team Chickpea, you’re sure to score a touchdown! These two-bite balls of Buffalo sauce bliss are similar to, yet somewhat different from my Buffalo Chickpea Burgers. Seriously though, in addition to slight variations in the ingredients, one of the main differences is that while the burgers are pan-fried, the meatballs are oven-baked. How should they be dressed? A little heat paired with a little coolness…what’s not to love? I just happened to create my own vegan ranch using the dry seasoning blend from my Ranch Chickpea Veggie Burgers. In addition to the ranch, I also topped my meatballs with some chopped scallions. What about the Buffalo sauce? Well, I’m not going to lie…I didn’t make it myself. Instead, I opted for Frank’s RedHot Buffalo sauce, which in case you weren’t sure, IS vegan. If you’d prefer another brand, I’d also recommend Tessemae. To make these Gluten-Free & Vegan Buffalo Chickpea Meatballs, start by making a flax egg by using a fork to whisk together 1 tablespoon of ground flaxseed with 3 tablespoons of water. Cover and set aside. Next, preheat your oven to 400°F. Then, roughly chop 2 medium carrots and 1/4 of a sweet onion, and measure 2 tablespoons of parsley leaves. Add the carrot, onion and parsley mixture to a food processor, and pulse until finely chopped, but not pureed. Next, heat olive oil in a non-stick skillet over medium heat. Add carrot mixture and kosher salt to taste, and cook on medium for 5 minutes, stirring occasionally. While the carrot mixture is cooking, rinse out the food processor and set aside for future use. Also, drain and rinse your chickpeas and set aside. When the carrot mixture is done, allow it to cool for 1-2 minutes, and then add it to the food processor along with chickpeas. Process on low until everything is well combined but not pureed, scraping down the sides as needed. Transfer chickpea mixture to a mixing bowl. Add gluten-free/vegan bread crumbs, nutritional yeast, flax egg, kosher salt and Buffalo sauce. Mix thoroughly until ingredients are well-combined. Use a small cookie scoop and scoop chickpea mixture onto a parchment-lined baking sheet. Then, use your hands to roll into rounded balls. While the chickpea meatballs are in the oven, melt 2 tablespoons of vegan butter in a microwave-safe bowl or glass measuring cup. Then use a fork to whisk in 1/4 cup Buffalo sauce. When the chickpea meatballs are done, remove from the oven and set the baking sheet on top of the stove or on a heat resistant surface or mat. Use a silicone pastry brush to baste each ball with the Buffalo sauce and butter mixture. Return the tray of basted chickpea meatballs back into the oven and bake for an additional 15 minutes. Allow to cool for 1-2 minutes before removing balls from the baking sheet. Serve with desired toppings, such as additional Buffalo sauce, vegan ranch dressing and/or chopped scallions. Team Chickpea FOR THE WIN! These Gluten-Free & Vegan Buffalo Chickpea Meatballs are the perfect party appetizer! They're especially delicious when drizzled with some homemade vegan ranch dressing and topped with chopped scallions. Use a fork to whisk together 1 tablespoon of ground flaxseed with 3 tablespoons of water in a small bowl to make the flax egg. Cover and set aside. Blend carrots, onion and parsley in food processor on the pulse setting until finely chopped, but not pureed. You may have to stop to scrape down the sides. Heat olive oil in a non-stick skillet over medium heat. Add carrot mixture and kosher salt to taste, and cook on medium for 5 minutes, stirring occasionally. While the carrot mixture is cooking, rinse out the food processor and set aside for future use. When the carrot mixture is done, allow it to cool for 1-2 minutes, and then add it to the food processor along with the chickpeas. Process on low until everything is well-combined but not pureed, scraping down the sides as needed. Transfer chickpea mixture to a mixing bowl. Add bread crumbs, nutritional yeast, flax egg, 1/2 teaspoon kosher salt and 1 tablespoon Buffalo sauce. Mix thoroughly until ingredients are well-combined. Use a small cookie scoop and scoop chickpea mixture onto a parchment-lined baking sheet. Then, use your hands to roll into rounded balls. Bake for 15 minutes. While the chickpea meatballs are in the oven, melt vegan butter in a microwave-safe bowl or glass measuring cup. Then use a fork to whisk in 1/4 cup Buffalo sauce. When the chickpea meatballs are done, remove from the oven and set the baking sheet on top of the stove or on a heat resistant surface or mat. 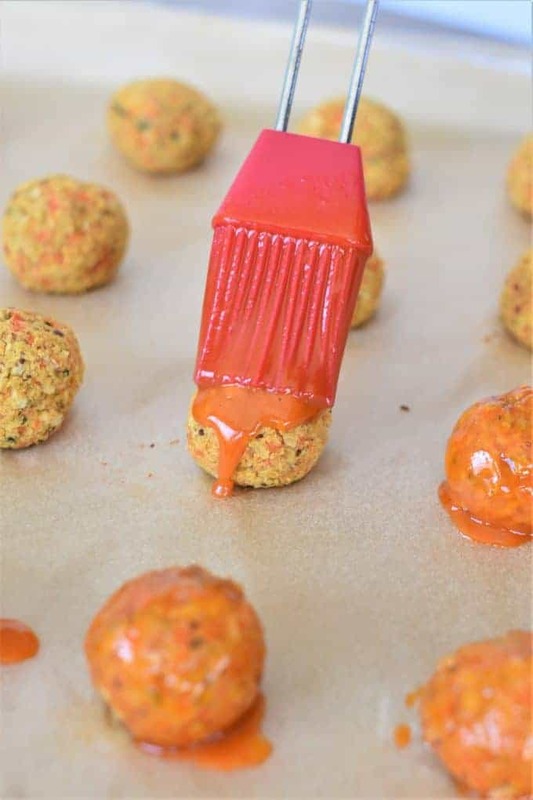 Use a silicone pastry brush to baste each ball with the Buffalo sauce-butter mixture. I recommend a silicone pastry brush because it allows the sauce to just glide easily over each meatball. In addition, silicone brushes are vegan-friendly and dishwasher safe. Leftovers are best reheated in the oven on a parchment-lined baking sheet until warm. Please note the nutrition calculation for this recipe does not include kosher salt to taste or any toppings. Wow, these meatballs surely look special, so delicious and flavorful. My kiddo is such a huge meatballs fan. I’m saving this recipe to give it a try. I’m sure he’s gonna love it. Oh I love these, especially the fact that they are baked and not fried! We are always looking for more vegan fare to add to the weekly meal plan and these sound like they would fit the bill perfectly! These little bits of goodness sure sound good! I love that they are gluten free & vegan too. Yummy! Love that these are gluten free and vegan :). Thanks so much for sharing! Ahh I’m definitely team chickpea now ;D These look awesome…love the creativity behind this. Yum! Even the carnivores in our family would chow these Buffalo meatballs down. They are huge Frank’s Hot Sauce fans and I even have to buy it in the oversized jars. Those delicious morsels will be gone way before the game starts. Hope you made enough! !